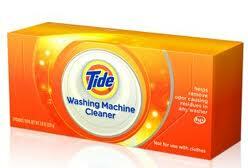 Flip Out Mama: Free Tide Washer Cleaner Packets- first 5000! So what are you doing at 2pm today? Get on Facebook to get a free packet of Tide Washing Machine Cleaner. It will start at 2pm EST and I doubt it will last long, so be ready! First 5000 only.